Q: How do you think about your role today at FM Global? A: I have now been with the company 21 years. It’s just as challenging today as it was when I started more than two decades ago, although the challenges have evolved. On my second day after joining the company, I was introduced to the CEO at the time who said, “Just remember one thing, Steve, you’re only as good as the last thing you achieved.” That’s stuck with me every single day. Because of that advice, I am constantly pushing myself and constantly asking myself if there is a better way. Is there a better way to understand where the business is going? Is there a better way to add value? Is there a better way where public relations can help enhance the competitiveness of the organization? That mindset may drive some people around me crazy, but I believe avoiding complacency is healthy. FM Global is one of the world’s largest business property insurers. We have a very unique focus. We’re perhaps the only property insurance company in the world that helps clients prevent disasters from happening … a fire, a wind storm, cyber attack or whatever can happen to your organization’s property that can disrupt its operations. When disasters happen it’s often because of what someone did, or didn’t, do. As a company, we look at parallels from that perspective and consider what can we do to enhance the resilience of our business and our clients and what are the proactive opportunities for public relations to add value. Q: What’s under your responsibility? What types of things do you have to do as a leader for your team? A: I am the only person at FM Global whose sole role is handling public relations and I work with PR agencies in a wide variety of markets around the world. Part of my responsibility is to provide strategic leadership and direction to our public relations teams where needed, primarily in North America, but also to ensure that our public relations agency partners – I emphasize partners because that is truly how we look at our consultants that work with us – to ensure that their efforts are also aligned corporately. We do whatever we can on a daily basis to help position our agency partners so they can have maximum success and business impact in the markets they serve. Q: What are you seeing as sort of the biggest opportunity for public relations these days? A: It’s important to think about how public relations can become more of a competitive advantage for one’s organization. After all, business leaders are thinking about their organizations’ competitiveness, growth, retention of clients, profitability, and how to improve those numbers positively. Similarly, on the public relations side, we as practitioners need to be thinking about aligning our efforts to enhance our organization’s key business drivers. Q: We often get asked what are some of the best companies doing; what’s an innovative practice? With your goal of helping maintain a competitive advantage, is there something that your teams are doing that you feel is especially innovative or something you’re especially proud of? A: In North America, for example, we partner with two public relations agencies who work collaboratively. While each agency has their specialty, if you were to look at their public relations plans, they are surprisingly similar strategically. The only main difference is the audiences that each agency focuses on. One of those strategies is focused on something that goes on completely behind the scenes. It’s about how we, as a public relations team, streamline workflow, remove obstacles, and leverage metrics to ensure that we are working in the most efficient and effective way so that we can execute for maximum impact. This is something that we revisit regularly on our weekly calls with our agencies, not only to ensure we are executing well, but also to ensure that we are really focused on doing things right and doing the right things. Q: Is there an example of things that you have stopped doing or started doing as you’ve analyzed efficiency and how to do things better? A: We embrace the notion that strategy is the art of sacrifice. It’s the idea that it’s better to focus on doing a small number of things very well instead of trying to do too much. That’s why our public relations plan has just five core strategies, which may seem surprising for an organization of our size. Also, to be more efficient and ensure that we are focused on what matters most, we developed an efficiency tool that can help anybody on the PR team think in an aligned manner. We call it our “Relevancy Gauge” which we use for evaluating potential PR opportunities. It essentially looks at three aspects: what’s at the top of our target audiences’ agenda? What communications channels are most relevant to those audiences? And what’s the desired outcome of our public relations efforts? When members of our PR team present ideas to us, we ask them to first use the relevancy gauge to score potential PR opportunities on a 0 - 7 scale in each of those categories and come back to us with opportunities that score four or higher. It gets everyone to think at a strategic level and with a level of consistency. Q: Do you have any predictions in the year ahead, or even ten years ahead, of what’s next in terms of communications and strategy? A: Disruption and distraction brought on by such forces as digital transformation are seen as the new norm for the future, yet in some ways it’s changeless because it’s been happening for decades. That requires ongoing strategic thinking to avoid being distracted by technology, to see beyond the latest often over-hyped communications trends and to figure out how we in the PR field can have true impact with our target audiences. Looking ahead, I believe PR professionals will increasingly play a role in helping their organizations develop more meaningful brand experiences as a way to help their organizations ‘stick’ more favorably in the minds of their key stakeholders. Here at FM Global, for example, we’re increasingly focused on creating relevant brand experiences based on evolving the tried-and-true elements of storytelling to put our target audiences right into the heart of our brand story in a way that’s relevant to them, that they can gain value from and can then add value back to their organizations as a result. Q: In your view, is focusing on the brand the most fundamental principle that communicators need to keep in mind? A: Fundamentally, I believe it’s most important to work on yourself first. A part of this comes back to having a level of personal dissatisfaction and continuing to work to add more value, and to see yourself fundamentally differently as a PR practitioner. Ideally, we as practitioners view ourselves – and are seen as – business people first, who happen to specialize in the communications or public relations field. Many practitioners, especially early in their careers, focus first on how they can be the best public relations person, and then secondly on how to align their skills to the business. I believe it’s potentially more advantageous to come at it from the reverse perspective of being the best business person you can be first. The challenge is that some communicators with a more tactical mindset are metaphorically looking to create the next shiny object that’s going to wow everybody, or for how to get that next great piece of media coverage. Sometimes they may lose sight of thinking strategically about what’s truly the outcome and how can it benefit their organizations in a lasting way. 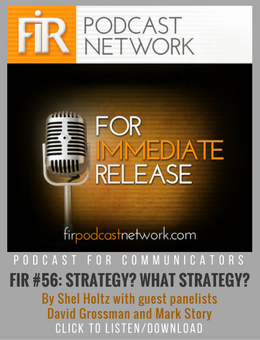 There is a place for creating sizzle, but public relations is at its best when we start with a business mindset and strive to be strategic thinkers. It’s a lofty challenge. That’s why this job is challenging every single day. One cannot rest on their laurels because one’s employer and their clients aren’t sitting still, nor are their competitors. Steve Zenofsky, APR, Fellow PRSA, is assistant vice president, public relations for FM Global, one of the world’s largest business property insurers. With a PR career spanning nearly three decades in the corporate, non-profit and healthcare sectors, Zenofsky is Accredited in Public Relations (APR) and was elected in 2012 to the Public Relations Society of America’s prestigious College of Fellows, one of the highest honors bestowed by the organization. Click below to download—Most Read Blogs of 2018—and get strategies to help you elevate your leadership and communication in 2019.